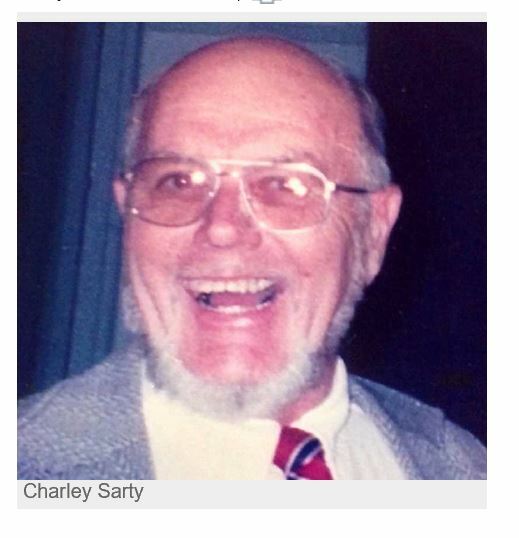 Charley Sarty was born November 17, 1937 in North Bend Oregon to Gene C and Viola Mallatt Sarty. He died September 26 2016. The family returned to live in Molalla when he was 8 months old, where he attended grade school and high school. He graduated from Molalla High School in 1956 where he had lettered in basketball, football and baseball. He attended Oregon College of Education for two terms. Charley worked during the summers of 1952 and 1953 clearing fire trails with his buddies, Don Cushing and the rest of the crew. He then worked for John Tiffin at the old Ideal Market. Charley enlisted in the National Guard in Silverton Oregon, December 2, 1954 and was honorably discharged December 6, 1962. During those years he also worked for Crown Zellerbach, planting trees. Then he went to work for Avison Lumber Co. in March 1959 and began his working career as a millworker, certified lumber grader and mill supervisor for the next 40 years ending March 1999 the last four months was with Floregon. He was married to Paula Sinclair in 1959 and they had 4 children, Dalene, Stacy, Liane and a baby boy who died at birth. They divorced in 1965, he and the children lived with his parents for several years until the children went to live with their mother in June of 1972. Charley and Shirley married and joined their families on July 28, 1972. They celebrated 44 years together on this last July 28, 2016. Charley was predeceased by his parents, grand­parents, aunts, uncles and several cousins whom he loved so much, his father in-law and mother in-law, Frank and Margaret Sarc. He is survived by wife, Shirley, son Stacey (Valda), daughters Dalene Kunkel (Larry) and Liane Sarty; stepsons Bradley Schuldt (Jeanie), Brent Schuldt, Bruce Schuldt (Audra), Bryce Schuldt (Linda); 22 grand­children, 7 great grandchildren, his sister in-law and brother in-law Don and Doreen Calmus as well as many dear friends. Service was held at Molalla Funeral Chapel, 220 E Main Street, Molalla, Oregon, Saturday October 1, 2016 at 1:00pm. Internment was at Canby Zion ­Memorial Cemetery, 463 S Walnut Road, Canby, Oregon. Following there was a brief ceremony and reception held at the Molalla Moose Lodge, 419 Echard Avenue, Molalla, Oregon. In lieu of flowers, donations may be made to the Molalla Fire District #73 with the notation “In memory of Charley Sarty for the Fire-Med Program.” mailing address P O Box 655, Molalla, Oregon 97038.